Michael Mulhern stepped down as chief of the MBTA’s pension fund in June 2016. Nearly a year after the head of the MBTA pension fund resigned, the board has yet to name a permanent replacement, even as it faces mounting pressure to address the system’s uncertain financial future. “We’ve encouraged them to get going on hiring an executive director,’’ said Brian Shortsleeve, acting head of the Massachusetts Bay Transportation Authority. The pension board’s spokesman, Steve Crawford, declined to comment on the search for a new executive director. Michael Mulhern announced his resignation from the fund’s top position last June, days after Governor Charlie Baker signed a bill making the pension plan subject to the state’s public records law. Mulhern left the job in August. Since then, the deputy director, John Barry, has been acting as interim chief. The hiring of a permanent replacement for Mulhern is complicated by several factors, according to people with knowledge of the situation. For one, the pension fund has been under scrutiny for three years because of questions about failed hedge fund investments it kept secret, and accounting practices that masked the system’s growing liabilities. The fund also is under pressure from the Baker administration to turn over some or all of its investments to the larger state pension system, to improve performance and save on fees. One step, for instance, could be to move the management of alternative investments — such as private equity, hedge funds and real estate — to the $65 billion state fund, said the people with knowledge of the matter. Such a shift would affect the nature of the T pension chief’s job. If a large portion of the most complex investments are moved, for example, the new director could be more of a manager or administrator, rather than someone with deep investment experience. The Senate passed a budget amendment to create an 11-member commission to review the fund and make recommendations to address its problems. Among the proposed members of a commission would be an appointee each by the governor, the attorney general, and the treasurer. A week ago, Shortsleeve warned that the transit employees’ $1.5 billion pension fund could need $1 billion in additional funding to pay benefits over the next 18 years. That could require taxpayer infusions, spending cuts, or big fare increases. The pension fund is a private trust, with no taxpayer guarantee to meet its obligations. Crawford, the fund spokesman, in a statement said the T’s estimates are off the mark, because they assume a conservative 4 percent investment return going forward. The T pension’s annualized return over the past five years has been 8 percent, he said. Its return so far in 2017, through April, is 5.4 percent, he said, beating the 4 percent worst-case projection. “Regrettably, the projections presented by the MBTA are simply not supported by historical facts,’’ Crawford said. One major reason the fund is struggling is that retirees earning pensions outnumber its employees — 6,685 to 5,786. Most of the other large retirement systems in the state have more people paying in than are receiving checks. The City of Boston, for instance, had 14,235 active employees in the plan in 2015, and 9,925 retirees, according to the latest annual report of Massachusetts public pensions. 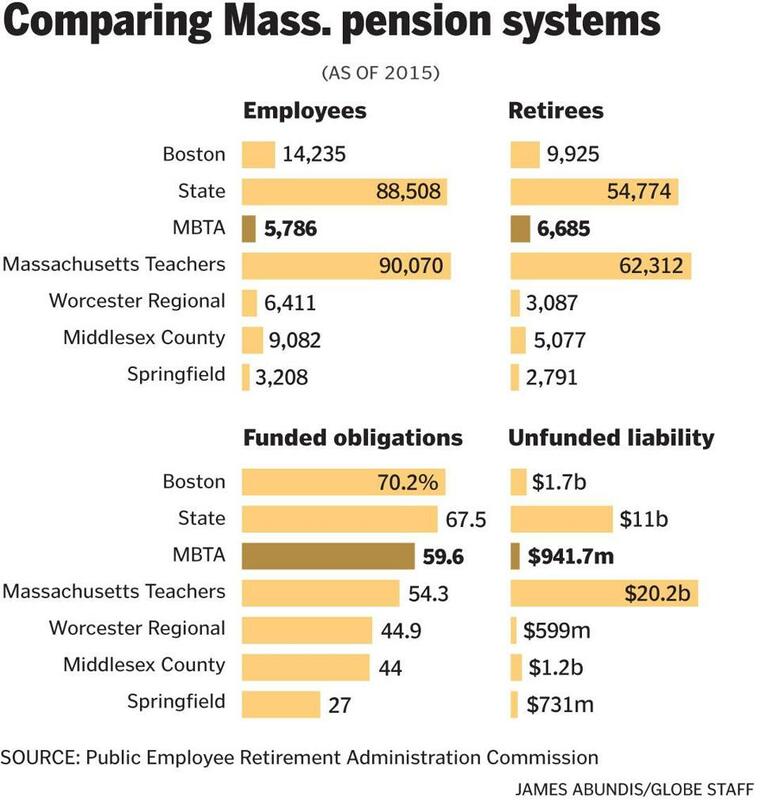 The Massachusetts Teachers’ Retirement System had 90,070 employees and 62,312 retirees. Crawford said layoffs, privatization, and early-retirement incentives since 2015 have hurt the T retirement fund. The moves have pushed 728 people into taking their pensions, he said, saving the T $61.5 million in payroll costs, but driving up costs for the retirement system. The T said that in a given year, 200 to 300 workers usually retire. Shortsleeve said the system is set up to encourage them to leave “in their 50s or earlier,” putting additional pressure on the fund’s finances. Shifting investments to the state board, called Pension Reserves Investment Management, does not get rid of the looming liability problem. The teachers, as an example, have their investments managed by PRIM but remain responsible for their own liabilities, 54.3 percent of which are funded so far, a figure below the T’s current 58 percent. The difference is that with the teachers, or the cities of Boston and Springfield, local or state government — and taxpayers — are required to meet the promised pension obligations. There is no backup plan for the T.
At the T’s fiscal control board meeting last week, at which Shortsleeve presented the gloomy pension forecast, state Transportation Secretary Stephanie Pollack said it would be irresponsible to ignore the fund’s problems. “As worried as I am about the MBTA’s finances, my priority is the folks whose retirement is in that fund, and whether it’s going to be able to meet its obligations,’’ Pollack said. Meanwhile, disclosures of investment returns are coming slower than ever from the T pension fund. Shortsleeve released the pension fund’s 2016 investment performance last week — 6.2 percent — more than five months after the year ended. The pension board said the numbers were still being audited. Most large funds, including the state system, take no more than a fiscal quarter to get final return figures. 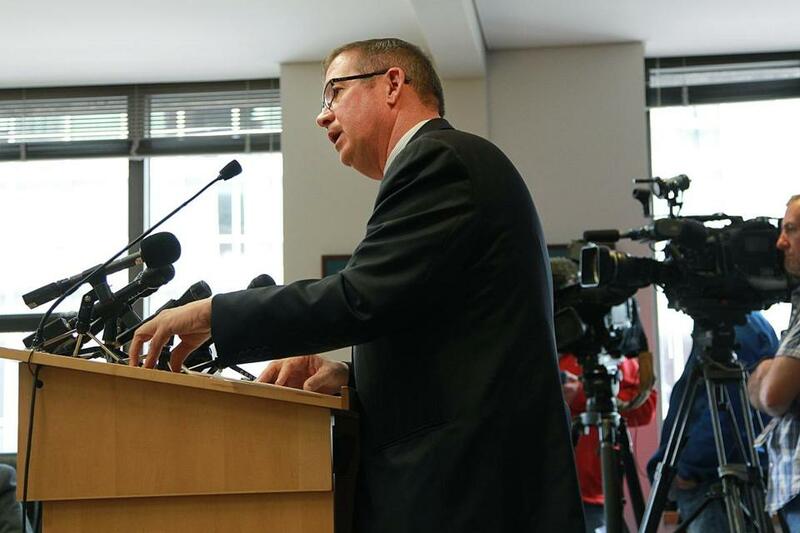 Shortsleeve, who has put a focus on the pension fund’s troubles over the past two years as the T’s chief administrator and acting general manager, plans to step down in June but will assume a seat on the MBTA’s fiscal control board. Steve Poftak, vice chair of the T’s governing board, will temporarily take over Shortsleeve’s responsibilities while the transit authority searches for a permanent chief. Nicole Dungca of the Globe staff contributed to this report. Beth Healy can be reached at beth.healy@globe.com. Follow her on Twitter @HealyBeth.